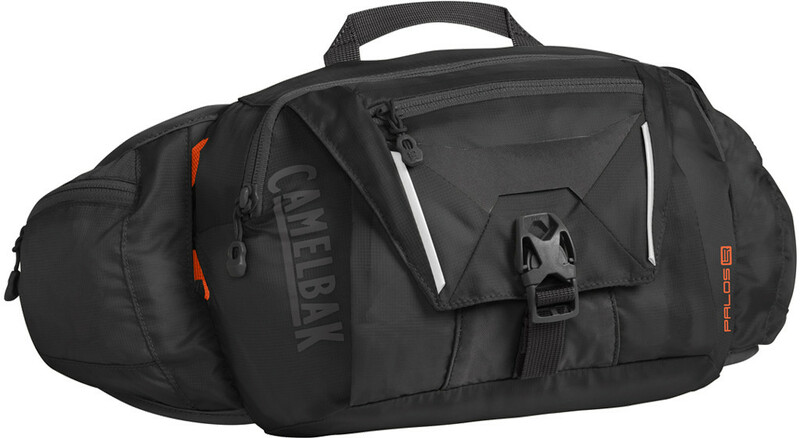 CamelBak: The Palos™ 4 is the industry’s first reservoir-based waist pack designed specifically for mountain biking. It’s the ideal option for hard-charging riders who need more than a water bottle, but who don’t want to carry a full backpack. As part of our Low Rider MTB collection, the Palos keeps your water and cargo centered around your waist, leaving your shoulders and back free. As a result, you’ll have a lower center of gravity and more mobility on the trail—plus, no more sweaty back and sore shoulders at the end of the day. The Palos also includes a 1.5-liter reservoir, storage for keys and a phone, an integrated tool roll to keep you prepped for last-minute repairs, and overflow storage that lets you fasten soft armor to the outside of the pack. PACK ONLY WEIGHT: 380g / 0lb 13oz WAIST FIT RANGE: 66-116cm / 26-46 in FABRIC: 100D Robic Nylon Dobby / 210D Nylon Oxford FEATURES: • The brand new Crux LR reservoir delivers 20% more water per sip while keeping weight positioned low on your back, which translates to better stability in the saddle and on the trail. • Magnetic Tube Trap™ keeps your tube secure and accessible when you need it. • Stabilizing load-bearing hip belts with cargo optimizes a custom fit and keeps essentials close at hand. • Integrated tool roll to keep your tools organized. • Dual reservoir compression straps cinch the reservoir into the small of your back for a tight, stable fit. • Breathable air mesh back panel for a lightweight, comfortable fit. • Reflective accents for visibility in low-light environments.